THE dramatic and controversial-themed Immaculada, Pag-Ibig Ng Isang Ina, starring award-winning actress Ara Mina, is the Opening Film of the 2019 Singkuwento International Film Festival Manila Philippines (SIFFMP). This Philippine premiere of the said film will be screened on February 15 (Friday), 7;00 PM, at Leandro Locsin Theater of the National Commission for Culture and the Arts (NCCA), #633 General Luna St., Intramuros, Manila. 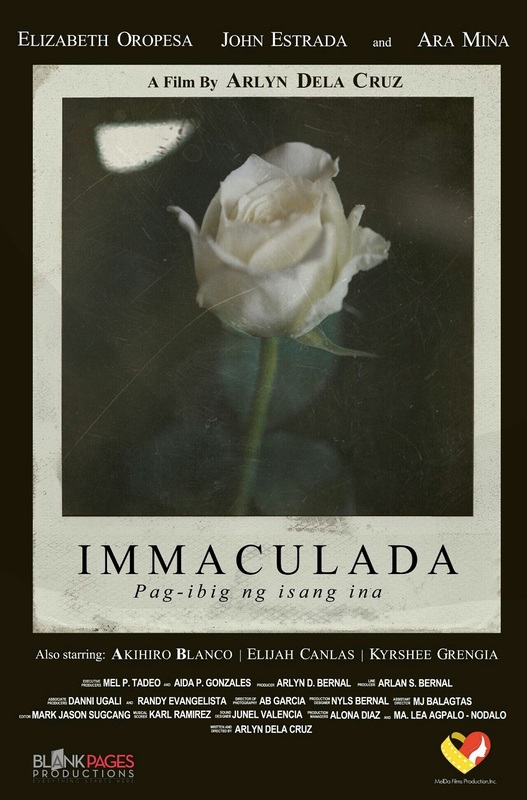 Written and directed by broadcast journalist and filmmaker Arlyn Dela Cruz, Immaculada, Pag-Ibig Ng Isang Ina also stars seasoned and likewise award-winning actress Elizabeth Oropesa, John Estrada (his first independent film), promising actors Akihiro Blanco, Elijah Canlas, Jeffrey Santos, Joel Saracho, Jun Nayra, etc. The film is a dark tale of a mother's love to his son. A continuation of a twisted love that seemed like a curse, one that was ended by an incomprehensible act of a mother's love. Based on true stories. “All the actors in this film gave their all. I have never seen Ara Mina succumb in total abandon to a character. John Estrada's silent agony was infectious. “Ms. Elizabeth Oropesa displayed an understanding of her character that allowed her to deliver what could be the most unforgettable yet disturbing portrayal of La Oropesa on screen. Watch out for Akihiro Blanco, he is a revelation,” said writer-director Dela Cruz. 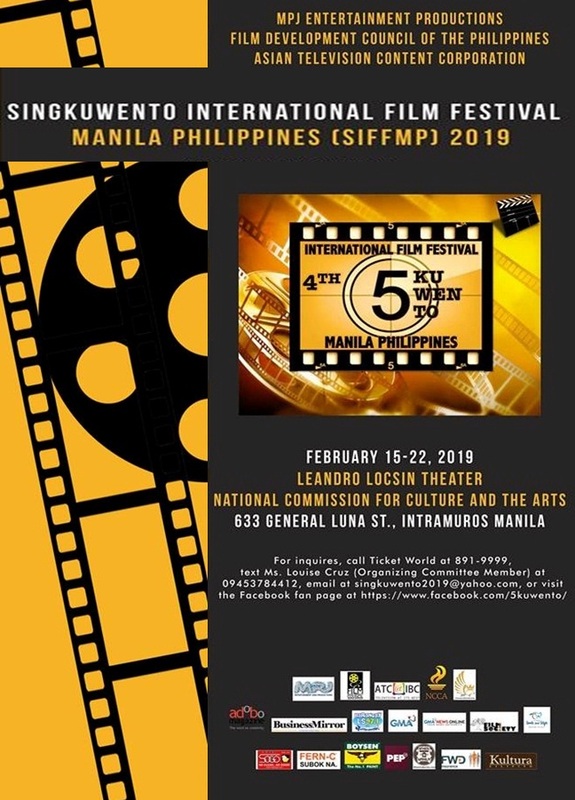 In celebration of the 100th year of Philippine Cinema this year and the National Arts Month this month, the festival will be held from February 15 to 22 exclusively in the said venue (NCCA). Founded by its festival director Perry Escaño, himself an independent filmmaker, this film event is presented by MPJ Entertainment Productions, in cooperation with Asian Television Content Corporation and Film Development Council of the Philippines. The festival’s main objective is to feature works of various Filipino and foreign filmmakers. It is an avenue for Filipinos both here and abroad to share their voice, sentiments and thoughts via the films they have created. It is also the festival’s aim to provide a channel for non-Filipinos to share their impressions of the Philippines and its people. This year, legendary and iconic actor Mr. Eddie Garcia is the recipient of the Lifetime Achievement Award, based on his outstanding achievements during his long career, and whose contributions to the improvement and promotion of the local film industry over the years are truly exceptional. The exciting SIFFMP Awards Night 2019 will be held on February 22 (Friday) at NCCA Theater, where Mr. Garcia will receive his award, as well as the winners in the various categories. It will have a delayed telecast over IBC-13 (airing date to be announced). The Jury members in the Documentary Shorts and Full Length Films are: entertainment journalist Marinel Cruz, film critic Noy Lauzon, and award-winning director Joselito Altarejos. Meanwhile, the Jury members for the Short Film competition are: award-winning filmmaker Zig Dulay, FDCP Executive Director Will Fredo, and producer-filmmaker Albert Almendralejo. For ticket inquires, call Ticket World at 891-9999, text Ms. Louise Cruz at 0945-3784412, email at singkuwento2019@yahoo.com.